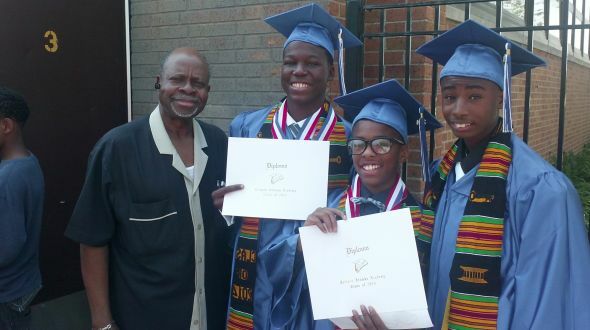 Coach adam and Coach brendan attended the attucks 8th grade graduation on monday, june 9th to watch Urban initiatives’ very first Attucks Work to Play soccer players Justin Smart, Daquan Hall and Renardo Coburn graduate! Attucks was Urban Initiatives’ fourth school, added in 2006. These guys started playing on the Work to Play team when they were in the 1st grade, and now they are all grown up! Standing next to them in the attached picture is Coach Nze. He has been their soccer coach from the very beginning and has been instrumental in their growth as soccer players and as leaders in character, health, and academics. Justin (second from left in the picture, next to Coach Nze), was the Class Valedictorian and is attending a National Outdoor Leadership School Adventure camp (backpacking, hiking, swimming, etc.) this summer in the Pacific Northwest, fully funded by NOLS and Urban Initiatives supporters! Next year, Justin will attend King College Prep; Renardo will attend Phillips High School; and Daquan will continue his education at Hansberry College Prep. This full circle moment is not made possible without the commitment of these three young men. Their dedication to the Work to Play program, the Take the Lead Program, their academics, and decisions to lead healthy and active lives set the groundwork for a successful elementary education. Urban Initiatives wishes these young men continued success as they pursue new learning, experiences, and development. We look forward to continuing to support these student athletes through their high school careers, and we cannot wait to see the significant impact these future leaders make on Chicago and beyond! Other notable Urban Initiatives graduates that we would like to congratulate include Willie Mae Brooks (Sherman), Dymond Fairley (Sherman), Elijah Perry (Reavis), Christian Gordon (Valedictorian of Sherman School of Excellence), and Aaliyah Nowell (Salutatorian of Libby Elementary School)! Congrats UI Grads!